The only thing more important than investing is understanding what you invest in. Without a solid understanding of the different investment types you are not investing your money, you’re gambling with it. Now that we’ve (hopefully) persuaded you to invest with our Introduction to Simple Investing. Your money is not making any money in your savings account. It’s time we break down the investment types you can (and should) invest in. We will cover stocks, bonds and a bunch of funds which are basically just bundles of stocks and bonds. It’s very important that you read through the whole article before you get started investing. We understand that this can be a rather dry topic so we tried to make it a bit more fun by drawing all of our analogies from Arrested Development. The illustrations are beautiful, Matt really outdid himself on this one. I also just want to mention that there are plenty of investment types that you will not find here like Options, Hedge Funds or Commodities. The reason is simple, we don’t think these investment vehicles at this stage of the game. We only talk about things we believe in and put our own money behind. Since we aren’t day traders, we won’t try and trade like them. Stocks (also known as equities) are the most discussed of all investment types. Most significant investment growth is fueled by stocks and that is because they on average contain the highest level of risk. Usually, your portfolio will be heaviest in stocks when you’re young and slowly taper into lower risk investments as you get older but don’t worry about investment objectives for now, we will discuss all of that later. Stocks are born when an owner of a company decides to sell some or all of their ownership stake in the company. This is usually done to raise money for the owner as well as the company. Facebook recently had an Initial Public Offering (IPO) so that early members of the company can cash in on what they created as well as provide the company with much-needed money to do things like building a new office or buy other companies. Buying a share of stock is how you buy a share of an existing company. Below is a simple example of the meaning and pricing of a share of stock. As you can see, The Banana Stand is valued at $100,000. 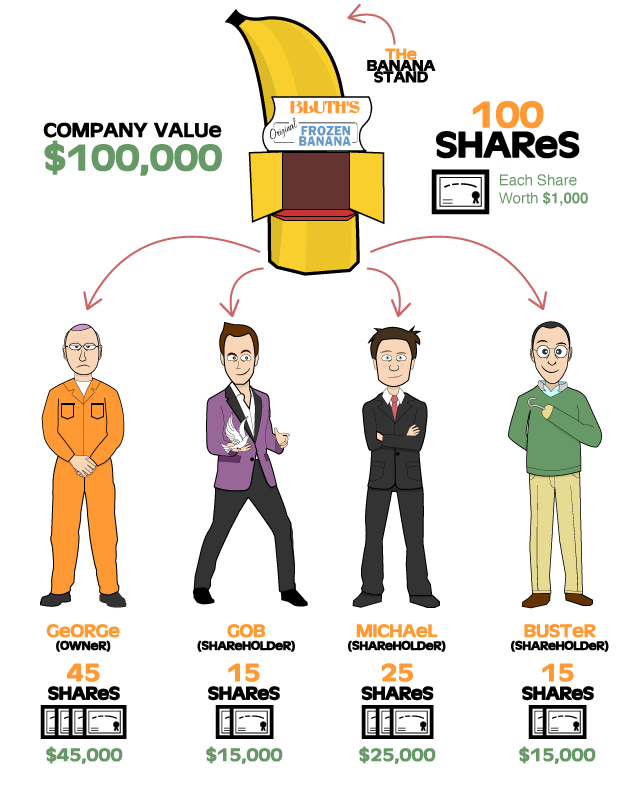 The value of Gob’s holdings is determined by the number of shares he has. In this example, he has 15 shares at a value of $1,000 each so the total value of his holdings in the company is $15,000. It is important to note that the value of a share is 100% determined by what someone is willing to pay. For example, if there is at least one other person willing to pay $1,000 per share then that’s the value of a share. However, if the highest price any single person is willing to pay is $900 per share then that’s the face value of a share. You can think of this in terms of any other thing you would try to sell. If you own an old laptop and try to sell it, you may personally feel it is worth $500 but if nobody is willing to pay that price you either hold on to the laptop until you find a buyer who will pay $500 or you sell for a lower price. When you are a part owner of a company (stockholder), you are also entitled to a few other perks. One major perk is the ability to influence companies decisions through voting. If you own 51% or more of a company you can make the company do pretty much whatever you like. If you own a smaller share you will need to team up with other owners to make important decisions. Even though George Bluth is the single largest shareholder (and founder) of the company, his son’s can easily team up to overrule him in even the most important business decisions. In addition to voting on matters that affect the company, some companies may vote to return some of its profits to shareholders. This is officially called a dividend although it can also be called profit sharing by some. No successful company will return all of its profits to shareholders because if it did, it wouldn’t be able to continue to grow and be successful. Usually, when a company offers a dividend, the shareholders have decided that money spent on growth is not as effective in creating value for shareholders as returning profits. A company that offers a dividend, therefore, can usually be considered mature and slower growing. As you can see, it can be very profitable to own stock in a company that has a high dividend yield. The dividend yield is simply the percentage of the value of your stock which will be returned to you over the course of a year. 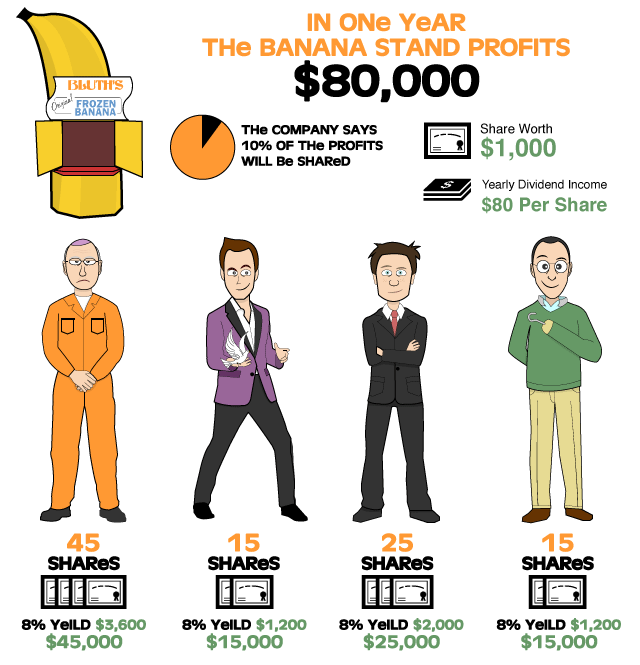 So, if a share in the Banana Stand is $1,000 then an 8% yield will return $80 in cash to the shareholder ($1,000 x 0.08 = $80). Since the dividend decided by the company is a percentage of profit, the cheaper the price of a stock, the higher the yield will be. As the price of a share goes up, the yield goes down. In the example above, if the price of the stock was $2,000 a share the yield would be 4% ($2,000 / $80 = 4%). A significant way to profit from being a shareholder is through holding the shares for a long period of time and collecting a ton of dividends. With this strategy, you can continue to profit consistently from your shares in a company regardless of the stock price. The only way your dividend can change is when the company changes the number of dividends paid out to shareholders. This is a number that does not change often in large companies. While there is definitely good money to be made with dividends, the majority of profits you hear about in the stock market are captial gains through selling shares at a higher price than you bought them for. Buy low, sell high. The price goes up when people are willing to pay more for a share of a company. It is reasonable to assume that as a company grows bigger and becomes more profitable people will be willing to pay more for a company, and the reverse happens when business is bad. There will always be dramatic news stories that come out seemly on a weekly basis which will affect the share price of a company, it’s important that for the most part you ignore this drama barring any cataclysmic events. 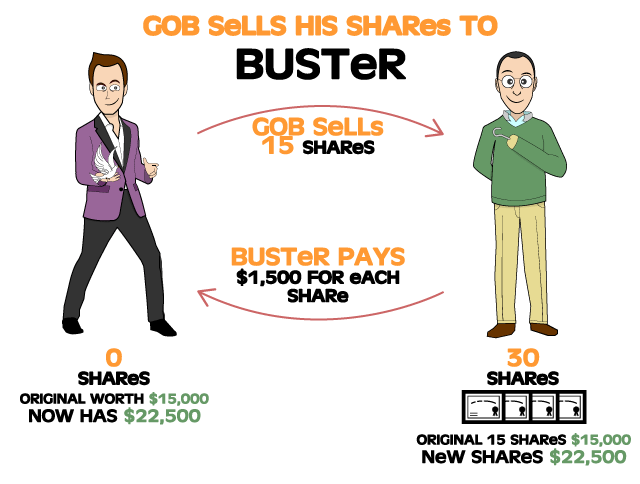 In the example above Buster sees future value in the company so he is willing to buy the shares for more than Gob originally paid for them. The future is, of course, unwritten so here is where the risk comes in. 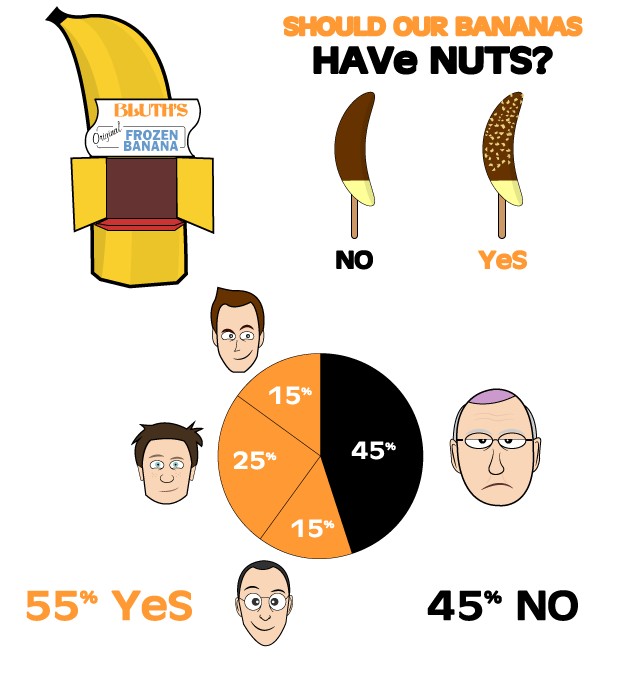 If Buster is correct in the future prospects of the Banana Stand, he can profit much like Gob just did. Keep in mind that you only gain or lose money on a stock when you sell it. So, if the stock price goes down you technically didn’t lose any money and if the price goes up you didn’t make any money. This is why when you invest for long-term growth you should largely ignore day to day and month to month fluctuations in the stock price. Regardless of the price, you still own the same amount of the company so the only thing that has changes is the perception of your shares value. A smart investor is willing to ignore the noises of the herd and calmly hold on to their shares until it is the right time to sell. Never make a decision based on emotion, be logical. Just like people, many times companies may feel it is necessary to take on debt in order to achieve their goals. So, where owning stocks is owning a piece of a company, owning bonds is owning a piece of a companies debt. Most bonds are created for company expansion. As you can see, the company wants to open a second Banana Stand, but they don’t have enough money to fund this expansion on their own. As a result, they basically crowdsource this expansion through the issuing of bonds. Like with any debt, there is an interest rate associated with the debt and this is attached to a bond. The higher the risk of the company not repaying the debt, the higher the yield of their bonds. This yield is paid out to a bondholder in a predetermined frequency over a predetermined length of time. While the frequency of payment is generally less important for an investor, the length of time is important. The length of time a bond exists (otherwise known as a bond’s term) directly affects how much money a bondholder can make if they hold out until the bond matures. Maturity is the fancy word used for the time when the initial debt principal is returned. Like stocks, a bond’s price can fluctuate based on perceived value. If people think a company will default on its debt the price goes down and if they think it’s highly unlikely that the company will default, the price goes up making it a high yield bond. Regardless of price, the amount paid per bond will remain the same so the cheaper a bond is, the higher it’s yield will be. 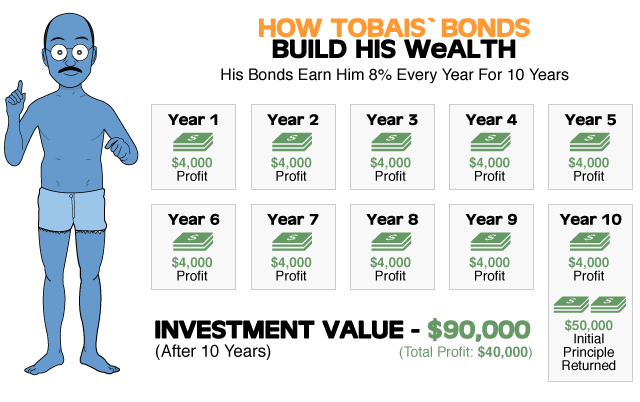 As you can see, Tobias stands to make $4,000 a year from his bond holdings ($50,000 x 0.08 = $4,000). Holding this bond to maturity will give him a profit of $40,000 nearly doubling his money. A high bond rate like this is not typical and usually indicates higher risk. 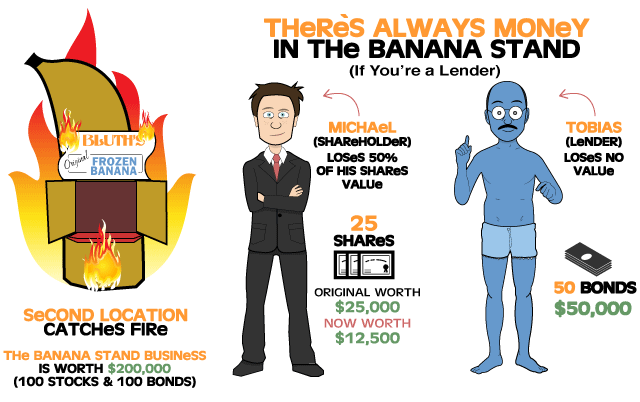 Speaking of risk, it seems the second Banana Stand just caught on fire (I’m sure Michael didn’t do it!). The reason bonds are considered low-risk, as compared to stocks, is because bondholders are always paid first. This is no different than if you sold a house for a loss while still having a mortgage. The bank (bondholder) gets all of its value back first and you (the owner) get whatever is left over after they are paid. In the case above, the business lost half its value so Michael’s stock is worth half of what it originally was valued at. The major form of profit for a shareholder is to sell the stock for a higher price and this really hurts Michael’s chances of returning a profit this way. Tobias, on the other hand, doesn’t lose any of his interest payments so while the value of his bond may go down on the open market, the bond’s income will remain the same. Since bonds retain their income better and are less risky than stocks, people add bonds into their portfolios to lower their overall risk. Plus, when you are older, the income from bonds are more valuable to you as compared to a stock who’s value can only be tapped when it is sold. An extremely successful retirement strategy is to slowly move your investments into bonds as you get older to reduce your risk and increase your income. This is something that can be done seamlessly in Betterment through lowering your risk slider (as we describe in The Betterment Experiment). Funds are simply a bundling of stocks and bonds. Many funds focus specifically on stocks or bonds, and some of the more specialized funds contain a mixture of both. Funds are particularly popular at Listen Money Matters because they have diversification built into them. Generally speaking, when you buy a fund you’re buying into an investment strategy of a specific set of portfolio managers. Before we get into each of the investment types of funds in a bit more detail I just want to mention the downside to almost all funds – their fees. Since maintaining a fund requires a ton of work, this work needs to be paid for through fees. That said, not all funds are created equal and some fund managers are particularly greedy. As we discussed in An Introduction to Simple Investing, even 1% in fees can eat a significant portion of your long term investment profits so we highly recommend you relentlessly work to reduce fees. If funds like this interest you, check out the best Vanguard funds. They are basically bundles of stocks and/or bonds depending on the type of Mutual Fund you buy. For example, you may buy emerging market funds, tech funds, energy company funds, etc… Usually you invest in a specific Mutual Fund because you are interested in the niche that fund is covering. There are a few major differences between Mutual Funds and the rest of the other funds. A Mutual Fund’s price doesn’t fluctuate during the day, it is bought and sold based on the closing price of the previous day. Most Mutual Funds have investment minimums as a barrier to entry. If you want to get into a great fund, be prepared to have at least $5,000 that you plan to invest with. ETFs are what Mutual Funds wish they were. Often their fees are lower, they have no investment minimums and their prices fluctuate with the market. Like Mutual Funds they comprise specific investment areas and thus have multiple stocks and/or bonds under their hood. Many core things we discuss across Listen Money Matters are ETFs, like Index Funds for example. Generally we prefer ETFs over Mutual Funds. 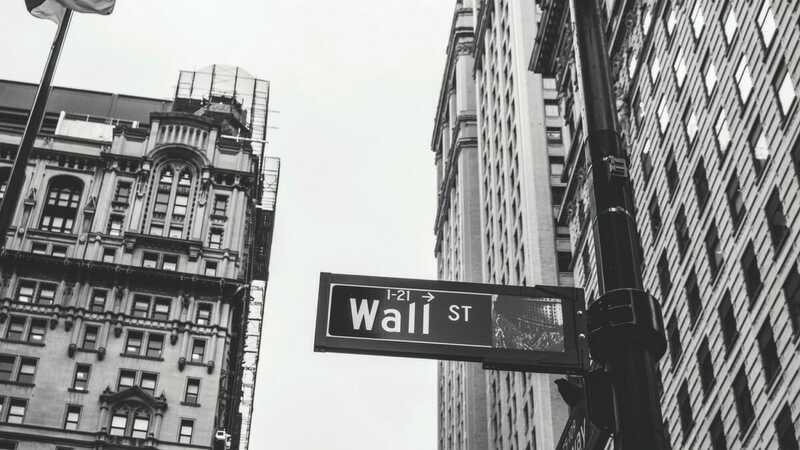 Index Funds are a specific type of ETF and they warrant their own section because we feel they are critical to any successful investment strategy. We feel this way because they are extremely diversified and are used as the benchmark of performance for many investment types. Since their performance is generally very solid we figure, why not just invest in the benchmark itself and leave the worrying at the door? The Dow Jones Industrial Average and the S&P 500 are examples of Index Funds. There are many many more but remember, as they get more specific they also get riskier. 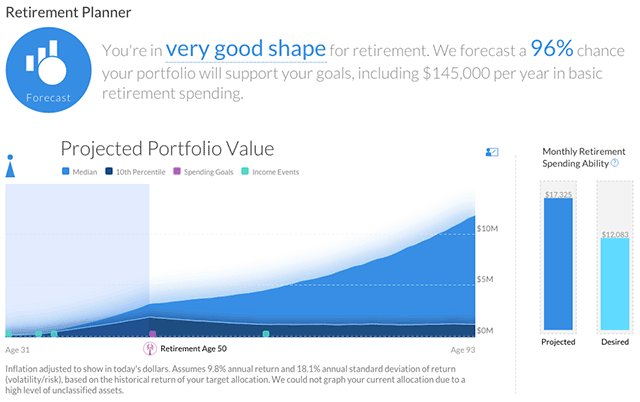 Betterment only invests in Index Funds which is why we love them so much! You can find these in most retirement accounts as their ultimate goal is to be the be-all-end-all of retirement investing. Usually they will carry names like Vanguard Target Retirement 2050 Fund. As you can see from the graph below, they start out very heavy in stocks and slowly over time transition into bonds. Exactly as any good investment strategy would. The year 2050 simply refers to the planned retirement date, this way you can pick the fund that best matches your life plan. Why did we decide to show you a Vanguard fund? Because their fees are dirt cheap and they have rockstar performance. Personally I try to never invest in a fund that isn’t from Vanguard because of those reasons. Yea, we just wanted to throw this in there to remind you, your home is an investment. Like a stock, its price can go up and down and if you sell it you can turn a profit. You can earn an income from it if you rent it out and if you live in it when it’s paid off it will significantly reduce your living expenses. A solid retirement plan includes low expenses so having a paid off home is a nice addition. While we we consider Real Estate an investment that’s worth being discussed at Listen Money Matters, we’re not going to go into too much detail here because it really deserves some guides of its own. When these guides are done we’ll include the links below. Definitely expect guides on how to buy a home, refinance, rent profitably and pay off mortgages early through a little discussed mortgage hack.